Defense information, Classified; United States; Databases. Updated with a new afterword, a true-life account of computer espionage tells of a year-long single-handed hunt for a computer thief known as 'Hunter,' a hacker who stole sensitive security and military information from American computer files to sell to Soviet intelligence agents. Reissue. 20,000 first printing. Amazon.com description: Product Description: Before the Internet became widely known as a global tool for terrorists, one perceptive U.S. citizen recognized its ominous potential. Armed with clear evidence of computer espionage, he began a highly personal quest to expose a hidden network of spies that threatened national security. But would the authorities back him up? Cliff Stoll's dramatic firsthand account is "a computer-age detective story, instantly fascinating [and] astonishingly gripping" (Smithsonian). Cliff Stoll was an astronomer turned systems manager at Lawrence Berkeley Lab when a 75-cent accounting error alerted him to the presence of an unauthorized user on his system. The hacker's code name was "Hunter" -- a mysterious invader who managed to break into U.S. computer systems and steal sensitive military and security information. Stoll began a one-man hunt of his own: spying on the spy. It was a dangerous game of deception, broken codes, satellites, and missile bases -- a one-man sting operation that finally gained the attention of the CIA...and ultimately trapped an international spy ring fueled by cash, cocaine, and the KGB. 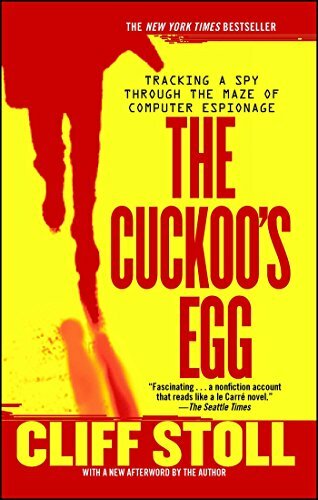 from Doubleday (September 1, 1989); titled "Cuckoo's Egg: Tracking a Spy Through the Maze of Computer Espionage"
About: Updated with a new afterword, a true-life account of computer espionage tells of a year-long single-handed hunt for a computer thief known as 'Hunter,' a hacker who stole sensitive security and military information from American computer files to sell to Soviet intelligence agents. About: A true-life account of computer espionage tells of a year-long single-handed hunt for a computer thief known as 'Hunter,' a hacker who stole sensitive security and military information from American computer files to sell to Soviet intelligence agents.